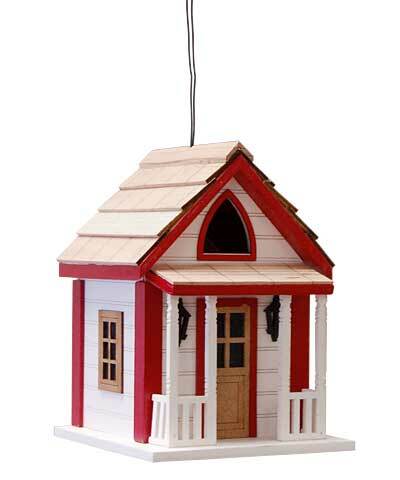 Elevate the style of your bird garden by placing this Home Bazaar Country Charm Cottage Bird House in it. The intricate details and bright colors on this shelter are sure to capture attention, while the size of the unit is perfect for small songbirds to use. Impressed, horizontal lines throughout the white, wooden frame evoke siding, and red trim on the corners, beneath the roof, and around the top, faux gothic window offer contrast. A pitched, lapped roof tops this adorable home, and matching wood on the porch roof furthers the classic architecture. Brown trim on the window and door shapes enhances the roof, and two black, wooden sconce shapes complete the item. Birds enter the piece through the top, pointed arch opening for a secure nesting spot. Ventilation gaps beneath the roof edges prevent birds from overheating, and a drainage hole on the base helps the nest remain dry. Remove the back panel to check the nestlings or clean the item at the end of the season. A cable through the top of the roof peak makes the home easy to hang, and the white and red tones offer a bright look to any setting. Allow this Country Charm Cottage Bird House to provide a rustic and beautiful home to your favorite songbirds. Note: Climate and the elements will weather this home and change its appearance over time; however, weathering will add to the item’s natural charm without compromising its function. Should you want to preserve the finish (paint) of this house, you should cover it with several layers of a polyurethane product that is recommended for marine use (UV Rated) that will not turn the white paint yellow. You should expect that once left outside, the home will weather and require refinishing.